This spacious 8.6ft x 4ft metal storage shed provides a secure place to store away gardening items, kids toys and outdoor furniture. 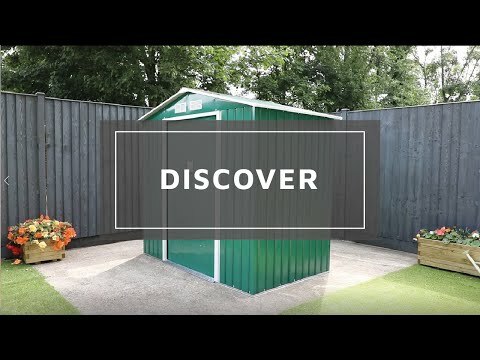 Made from hardwearing, robust materials, this metal shed will last for many years to come. This Waltons 8.6ft x 4ft Metal Pent Garden Storage Shed is built to last, providing a secure and weatherproof place to store away household, gardening and outdoor items. Constructed using low maintenance, high quality materials, this metal storage unit is ideal for all gardens. Made from strong steel framing and pre-assembled panels, this metal garden shed provides a secure area to store your items. The windowless design keeps your items out of sight and the double doors can be fitted with a padlock for extra security. This metal shed will look great for many years to come and is available in two colours; light and dark green. 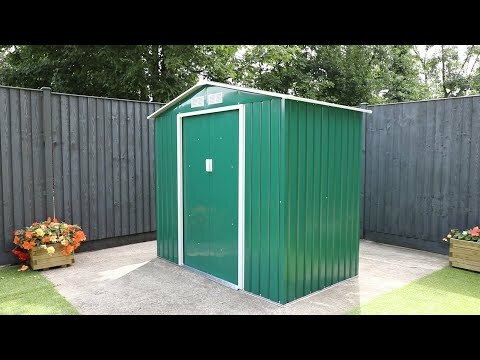 These metal sheds do not require annual treatments or paints. The pent style roof allows rainwater to disperse towards the rear of the garden shed, protecting the storage unit from weather damage. Air vents are integrated into the metal shed to increase air flow, prevent the build-up of condensation to keep your items dry and protected. Please note these metal garden sheds are not supplied with a floor. We recommend using the 8.6ft x 4ft foundation kit to securely fasten your metal shed to a concrete base to offer additional strength and security. Made from high quality galvanised steel, this foundation kit will raise the metal shed from the ground and will help to support the structure of the garden building. This product requires home assembly.